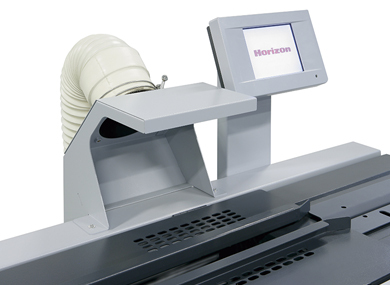 The Standard Horizon BQ-160 PUR Single-clamp Perfect Binder produces professional-quality books with a simple and efficient binding procedure, and the binder is also capable of padding and tape binding. PUR Perfect Binder: For more information about PUR binding, click here. Easy-to-use touchscreen controls: A dynamic color touchscreen allows the operator to easily adjust a range of settings including cover alignment with the spine, nipping pressure, clamping pressure, and much more. 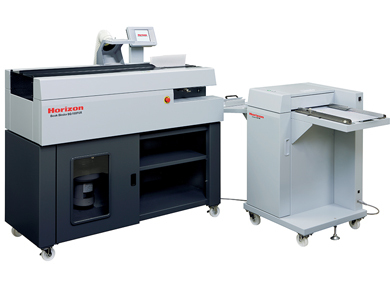 High-quality books: The BQ-160 can produce extremely strong, high quality perfect bound books up to 1.6” thick at speeds up to 180 cycles per hour and can handle light to moderate production needs in almost any environment. Other key features: Other features on the BQ-160 include energy-save and auto-off functions, the ability to notch in one or both directions, and an optional carbon air filtration system to reduce adhesive odors. Adding a cover: The BQ-160 Binder can be put in-line with the CRB-160 Cover Creaser, which is setup through the color touchscreen on the BQ-160. The scoring position is set automatically according to the book thickness input into the BQ-160.The CRB-160 scores up to 150 lb. laminated covers, and a wide variety of scoring patterns can be selected from the touchscreen. Standalone cover creaser: A standalone CRB-160 model is also available with an integrated color touchscreen, and it is ideal for creasing covers, restaurant menus, greeting cards and other digital print applications. Equip this fume extraction blower for clean and comfortable operation. The CRB-160 can be added in-line to crease covers.